Preston Park is Brighton and Hove’s first and largest public park. With 63 acres of parkland, this well-loved open space plays a huge role in the life of the city, offering a variety of sports and activities and hosting many major outdoor events. The park is also home to beautiful bedding schemes, a gloriously-restored walled garden and many fine trees, two of which are Champion Elms. It also boasts several interesting and unique buildings including the Rotunda, Clock Tower and Tile House. 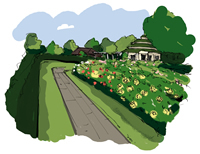 In recent years, many parts of the park have been restored as part of a 10-year project between Brighton & Hove City Council, The Heritage Lottery Fund and English Heritage. A regular winner of the Green Flag Award, given to quality parks and open spaces, Preston Park remains green throughout the summer because of an underground water source known as the Wellesbourne. Popular with families, the park has a large children’s playground complete with sandpit and facilities for a wide range of sports including bowling greens, eight tennis courts, football and cricket pitches, a basketball court and cycling. The council also organises regular health walks, a perfect way to keep fit and explore this wonderful park. For more information contact healthwalks@brighton-hove.gov.uk. During your visit, don’t miss the beautiful rock garden, situated on the West side of the main road. It’s one of the biggest city-owned rock gardens in Britain and is full of twisting walkways, streams and wonderful plants. It is reputed that the design was based on the popular willow pattern. Designed by Philip Lockwood in 1897, this two-storey brick and timber building has a distinctive balcony reached by metal stairs and was originally used by the park police. Look out for the cast iron box by the door with the letters and town crest of the former Corporation of Brighton. Designed and built by Captain Vertie MacLaren in 1937, this red brick flat-roof building is easily recognised with it s five glazed double doors leading to a terrace. Built in 1929, this circular single-storey building was the subject of a Heritage Lottery Grant, has been restored to its former glory and is now a busy continental-style cafe. Designed in Italianate style by Vertie MacLaren, the building has glazed timber doors, leading to a terrace and overlooking a rose garden. 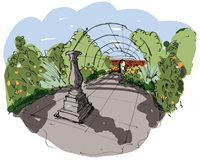 Originally designed by Captain Bertie MacLaren to draw people into the park, the rose garden was restored and replaned in 2001 with funding from a Heritage Lottery Fund grant. Work included planting 4000 old-fashioned shrubs roses, chosen for colour and scent, and renovation of the life-size French statues which represent two of the four seasons. This timber-framed, single-storey building designed and built by Captain Bertie MacLaren was originally the men’s bowling pavilion. Also known as the octagonal pavilion, this Grade II-listed tile house was bought in 1929 from the Wembley Exhibition where it was used to display a pottery company’s glazed tile work at the Bath and West Show. Designed by Philip Lockwood, the timber-framed building was originally moved to the park as a ladies pavilion. Built on the site of a railway embankment, using 1350 tonnes of stone from the Cheddar Gorge, the rock garden opened in 1936. Winding stone paths, steps and a rustic bridge follow the rocky cascade through different levels of the garden leading to a kidney-shaped pool. A walk to the top of the rockery reveals stunning views over the park, Preston Manor and St Peter’s Church. The Edwardian-styled walled garden re-opened to the public in 2001 after restoration funded by the Heritage Lottery Fund. The Grade II-listed garden was originally part of the manor gardens before becoming part of the park. Work has included the relaying of paths, replacing the lily pond, erecting a metal arch and re-introducing early varieties of period plants.